Deep hues of violet define this stunning solitaire ring from Apples of Gold. A single amethyst gemstone is all that's needed to make this beautiful ring burst with style and pizazz. The amethyst gem measures 6mm, 7mm or 8mm and is round cut to wonderfully display its shimmer. The facets of the amethyst are cut to give excellent brilliance to the stone. Secured in a four-prong setting, the amethyst gemstone is sure to make a fashion statement. A band of silver provides a solid base for this fabulous gemstone ring. 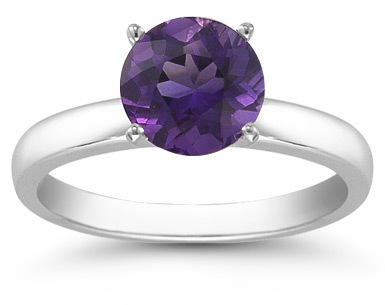 We guarantee our Amethyst Solitaire Ring in Sterling Silver to be high quality, authentic jewelry, as described above.